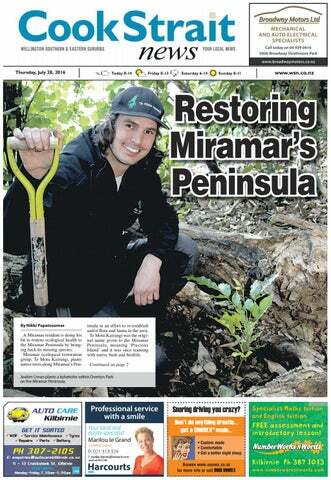 Joakim Liman plants a kohekohe within Overton Park on the Miramar Peninsula. Restoring Miramar’s Peninsula Continued from page 1 However, after the Europeans settled most of the bush was burnt down to make way for gardens and grazing areas for cattle and sheep. Project coordinator of the group, Joakim Liman, now wants to see the area transformed to its former glory by planting native trees and creating awareness in the community. A group of corporate volunteers prepare a site for planting. Cryptosporidiosis is a disease caused by parasites called Cryptosporidium. The disease cryptosporidiosis is spread from person to person after the parasites are shed and they may be found in soil, food, water, or on surfaces that have been contaminated with faeces from infected humans or animals. Chris Carey-Smith has come on board as the new coordinator of the Welington Timebank.  Police said anyone with any information about the robbery, or the alleged offender, could contact them on 381 2000, or anonymously through Crimestoppers, on 0800 555 111. So why wait? Enjoy leading innovation, phenomenal energy savings and complete THERE IS NOW A WINDOW comfort with Enerlogic window films. FILM WITH ENERGY SAVING Enerlogic lm gives you equivalent performance your windows without the huge price tag! through a fence of a house in Karepa Rd, Brooklyn, police said. Police said while they cordoned off the area and conducted an “extensive search” of the area, they were unable to locate the alleged offender. Police in Wellington are working to return thousands of dollars’ worth of power tools to their rightful owners. Detectives located a “hardware store’s worth” of what’s believed to be stolen property at a house in Newtown this week, after arresting and charging a man with drugs offences. Police also recovered computer equipment at the same house and a number of laptops and smartphones were found. Police said they now wanted to see the tools returned to their owners. Owners of the property were asked to contact Wellington Central Police Station on 381 2000. The Kilbirnie Lyall Bay Community Centre holds a drop in every day from 10am to 2pm. Everyone is welcome to pop in for a cup of coffee and a chat. For more information, contact the Kilbirnie Lyall Bay Community Centre on 387 7867. Enerlogic performs 4 times better than regular or standard solar window films, and in addition to keeping out huge amounts of solar heat, its primary benefit is maximising heat retention – creating a huge amount of energy savings and value for money. of standard double-glazing or Low E Glass, but costs a fraction of the price that you would pay to replace your current windows. Wellington mayoral candidate Jo Coughlan will host a meet-and-greet at Park Kitchen in Miramar on Sunday, July 31, at Franziska Seatoun in Seatoun on Sunday, August 7, at Blue Belle Cafe in Island Bay on Sunday, August 14 and at Spruce Goose in Lyall Bay on Sunday, August 21. Head along to discuss your thoughts on what you would like to see for the future of Wellington. A parade will take place on Monday to celebrate women in policing. U3A discussion group U3A stands for University of the Third Age, and is a global organisation that supports learning and social activities for people in the third age. The Island Bay chapter of the group hosts a weekly social get together with different speakers each week on fascinating subjects followed by tea or coffee and discussion. Meet-ups take place every Thursday afternoon at the Island Bay Community Centre from 1.30pm. Yoga for mums Yoga classes targeted at mums and bubs take place at the Island Bay community centre every Tuesday and Thursday from 9.30am to 10.30am and every Wednesday from 8pm to 9pm. Mums and dads are encouraged to bring their babies along to develop strength, tone, flexibility, relieve tension and stress and learn to move with more awareness. as one and carried in Monday’s parade by one of the first female police officers in New Zealand, Marie Storey, who joined in 1943, and one of the police force’s newest female recruits. Police Commissioner Mike Bush said the parade was not only a fitting way to end the national relay - it was an opportunity for the public to join in the celebrations. “Seventy five years is a significant milestone and I will be immensely proud to walk alongside just some of the many fantastic police staff, both men and women from around New Zealand,” he said. “Over the last couple of months many staff have been engaging with their communities in activities to mark the 75th anniversary, they are passionate advocates for police and have showcased police as a great career choice for women.”  The parade will start from Civic Square at 12.15pm on Monday August 1 and will travel down Mercer St, onto Willis St then down Lambton Quay to Parliament, where it will be welcomed by the New Zealand Police Kapa Haka group. establishing the city’s identity as “Creative Wellington – Innovation Capital”, the effects of which are still seen today. Ms Prendergast also cites other highlights as securing $220 million for social housing, creating the waterfront boulevard of trees from the stadium to the Michael Fowler Centre, adding 20 sculptures to the city, and working on the ASB Sports Centre in Kilbirnie. The Strathmore Park Community Centre Trust will be set St up later this year and we are seeking nominaaons from people interested in becoming board members. Strathmore Park Community Centre is a vibrant facility and a place for the community to enjoy events, programmes and social interaccons. Currently managed by Wellington City Council, the Centre will be returning to community governance. to teach children the SPCA’s important values. “It gives children a great opportunity to be involved and one of the best things children have is a large amount of empathy. “It’s just a lovely way to be able to teach children about what’s going on.” Last year Cupcake Day raised over $50,000 for Wellington SPCA, and all money raised went towards helping animals in its care. Wellington SPCA chef executive Steve Glassey said this year the organisation was once again looking for cupcake cooks of all ages and baking levels to take part. “Beginner or expert baker, the SPCA Cupcake Day is for everyone who wants make a real difference to the lives of abused, neglected and abandoned animals that need our help.” Steve said Wellington SPCA did not receive any direct government funding for its services, so the money raised by the community would help fund the rescue, rehabilitation and rehoming of the thousands of animals in need of the organisations help each year.  To register to take part in Cupcake Day, head to www.spcacupcakeday. co.nz and click register, the select Wellington SPCA as your local centre. You can also donate to the SPCA, set up a personalised fundraising page and return your funds through the website. Method: 1. Preheat the oven to 180oC conventional or 160oC fan-force. 2. Line a 12 hole muffin tray with paper cases. Sift the dry ingredients into a large bowl, then add the sugars and sift in. Add the SPCA Blue Tick egg, milk, oil and vanilla then beat with a mixer until combined. 3. Scrape the sides of the bowl then add the boiling water and mix until just combined (the batter will be runny). 4. Pour the batter into a measuring cup (it’s easier and cleaner than a spoon) and pour evenly into each paper case until filled (don’t over fill or the mixture will overflow). 5. Place into the oven and bake for 20-22 minutes or until a tester in the centre comes out clean. Sandra’s daughter Samantha Eng, with a foster kitten. 6. Let cool completely before adding fondant. soon as possible. You can also log it using the Fix-it app. The council also has an initiative called Blank It Out, which encourages communities to take charge of the areas that get regularly tagged in their neighbourhoods.  To volunteer, or adopt a spot to keep clear of graffiti, head to www. wcc.govt.nz. WINTER IS HARD ON BIKES... Basic fork servicing from $50, Rear shock’s from $35 Keep your ride performing at it’s best! A group of community spirited people are busy forming the Berhampore Community Association. Members of the Berhampore community are busy establishing the Berhampore Community Association. on establishing the group. She said the association was born from a need to bring the community together and give it a unified voice. “We have a diverse community here in Berhampore and we want to focus on bringing people together.” A community group has been on the cards for Berhampore since the Centennial Community Centre was opened to the public earlier this year. Berhampore resident Grant Smith has lived in the area for 20 years and has been chairing meetings with other residents, working on establishing the association for the past few months. “It is something that I have wanted for a long time, especially more recently given what happened in Island Bay, where the council was able to do what it wanted. “That is the sort of thing I don’t want to happen for Berhampore, I want us to have a voice.” Southern ward councillor David Lee said it was a great opportunity to put Berhampore “back on the map”. “Unfortunately the area suffers from being too close to Newtown and Island Bay. There is a huge opportunity for this group to now focus on branding Berhampore.” Southern ward councillor Paul Eagle said he was a fan of any mechanism that enabled a community or neighbourhood to come together and make decisions on the things that mattered most to them. "It's been a long time coming for Berhampore - they're not Newtown south nor are they Island Bay north. “They have their own identity and needs and the new residents' group will make sure they're visible. More importantly, it gives local people a voice on matters particularly when dealing with organisations like the council for example.” The group hoped to have themselves registered as an incorporated society within the next two months.  For more information on how you can be involved, head to the Berhampore Community Association Networks Facebook page. Foster is the seventh person Vincentian is more than a place to live—you become a part of our around the council table to make family. It is a place where you cana bid for mayor in this year’s fully enjoy your life with access local government elections. to excellent medical care. Visit The Onslow-Western Ward today and experience our homely councillor has held his seat for atmosphere. the past 24 years. Vincentian is more than a place to live—you become a part of our www.WellingtonCatholicHomesTrust.org.nz sue.delahunt@vincentian.co.nz family. It is a place where you can fully enjoy your life with access to excellent medical care. Visit today and experience our homely atmosphere. Wellington City Councillor Andy Foster will run for mayor of Wellington. Kids get all the excitement of challenging their friends at laser tag using the latest Laserforce battle suits as well as a choice of over 50 games in the Laserforce Wellington arcade. She brings with her many years of experience providing stylish Haircuts for her customers. Applications for the $1 million Wellington Regional Amenities Fund are open. The fund, chaired by Wellington Mayor Celia Wade-Brown, supports regionally significant organisations that help achieve strategic priorities for the region including economic growth, regional connectedness, and competitive advantage. The five-year-old fund encourages collaboration across the region. The fund is focused on arts, culture, and environmental organisations, which contribute to the attractiveness of the Wellington region as a place to live and visit. Applications close on Friday, August 5. Head to www.wcc.govt.nz for more information. Jessie Gibbs teaches taiko to students of all abilities across the capital. Prices valid Monday 25 July - Sunday 31 July 2016. Trade not supplied. Deals valid until this Sunday or while stocks last. We reserve the right to limit quantities. All prepared meals are serving suggestions only. Props not included. Available at New World stores Ohakune Down. Excludes Upper North Island and South Island. NW Gift Caonrd to be w each week! *Promotion valid Monday 6 June - Sunday 7 August 2016 only at New World Wellington City. One entry per spend of $40 or more in a single transaction (Excluding Gift Cards, Lotto, cigarettes and tobacco products). To enter, write your details on the till receipt and place in the entry box provided. Terms and conditions apply, see in store for details. The name Hataitai originated with the syndicate which sub-divided it for building in 1901, and derives from Whataitai, the ancient Maori name for present-day Miramar. The ridge of the hill was thought to represent the petrified remains of the great taniwha (sea monster) Whataitai, one of the two creatures who helped form the harbour of Te Whanganui-a-Tara (Wellington Harbour). When one taniwha broke through the rock that separated the lake from Cook Strait, the waters rushed out, leaving Whataitai stranded on rocks. Come in for a warm winter colour with Katrina and get a FREE cut and blow wave – saving you $75 colours from just $80. Offer available Tuesday to Saturday at Calibre Hataitai – ends 31 August 2016. We have exciting news to share – we’ve opened a new Calibre Salon in the Hataitai Village. Book online at calibresalon.co.nz Or call Calibre Hataitai Ph 386 1820 27 Waitoa Road, Hataitai. Associate stylist Zara will be based at Calibre Hataitai and the salon is open five days a week, from Tuesday to Saturday, with late nights on Tuesday and Thursday and all day Saturday. Plus, there’s free parking right outside the door. Step inside the world of Calibre! Call us on 499 4005 or call Hataitai on 386 1820 to make an appointment. Hataitai local business, Parsons & Associates, was first established back in the early 1930’s by a local man Len Parsons. After serving their apprenticeship with the company, registered electrical inspectors Mark and Richard decided to keep the Parsons and Associates legacy alive by purchasing into the business and growing the company into the formidable local business it is today, still serving out of their local Hataitai offices 85 years on. Mark and Richard, along with a friendly team of six fully registered tradesmen, three apprentices and two lovely part time office ladies - including their two little helpers, T-Rex the Jack Russell and Benson the Black Labrador - is ready to assist the local and wider community with all their electrical needs. *Limit one free potato fries per voucher per visit (value $4.90) with purchase of any burger (excludes kids burgers). Must mention this voucher in store Hataitai/Northland Burger Wisconsin. No other discounts apply. Present voucher to redeem. • Hataitai is one of Wellington’s eastern suburbs, lying between Mt Victoria and the Miramar peninsula. Main access from the city is through Mt Victoria via the traffic tunnel, or by bus through the bus tunnel. • Hataitai is on important transport links between the central city and Wellington International Airport. • Character villas and bungalows abound. Most of the 1752 dwellings were built between 1900 and 1940, have been refurbished and are owneroccupied. Deomolitin work is underway in Newtown, to make way for the Salvation Army’s new base. Q: What do you do to keep healthy? She says many of the elders who live at Kilmarnock Heights Home have little jobs they like to do to make a contribution to their home. “It makes them feel worthwhile and like they are making a difference. It’s part of our model of care,” says Annelize. “Some residents enjoy folding the kitchen linen because that’s what they would do for their family. Some feed the animals every day. It could be setting the tables with the fine China for afternoon tea, making birthday cards for fellow residents or baking treats for the home and the community. It’s the little things that give us a feeling of giving back and having independence.”  For more information about Kilmarnock Heights Home, located at 20 Morton Street in Berhampore, call 0508 ENLIVEN (that’s 0508 36 54 83) or visit www.enlivencentral.org.nz. Council chief executive, Greg Campbell, said the next three years would be crucial to Wellington, as decisions that needed to be made would affect Wellingtonians for years to come. “I encourage all voters to study the report – and to consider whether they, or someone they know, would stand up to be nominated,” he said. “Wellington region is a fantastic place to live and do business. Greater Wellington’s work is about ensuring we’re also a strong and resilient region that will continue to thrive and get even better. private companies”. “I have done the hard yards – it is the right time for the city the council, and for me.”  Mayoral candidates for 2016: Nick Leggett, Celia WadeBrown, Justin Lester, Jo Coughlan, Nicola Young, Andy Foster and Keith Johnson. Northern Ward Councillor Helene Ritchie will stand for Mayor of Wellington. Brown and the Wellington City Council, and soon the Sustainability Trust, to get their endorsement and supporters behind the project. “As we get closer to August and Daffodil Day, which heightens the visibility of the Cancer Society, we are confident that the project will kick in and that we will achieve our goals as was achieved by the Cancer Society in Auckland who have already completed a similar project.” Mike said the Cancer Society would appreciate it if the public could help out with the cause. “This project is about extending our services to meet the growing demand. I am sure everyone can relate to supporting that,” he said. The Cook Strait News will be tracking the Cancer Society’s process throughout its Power Up campaign. Check in each week to see updates on fundraising efforts. Saturday, 30th July. 10am - 2pm at St Anne’s Church Hall, Emmett Street, Newtown. Food, clothes, Bric-a-Brac, plants - all sorts! Stalls available. Call Noreen 021 02780601. Our summer pools were built byMiramar us. AFC Inc Blends in well did cause noRangers fuss. Notice A1 DRIVING SCHOOLof Public With hydro slide will cause a splash. And to it many people dash.109 ANNUAL Community Meetings Advertise yourThrough native bush we twist and wiggle. Rongotai College is seeking a self-motivated, energetic and hard-working person to fill the th role of fulltime caretaker. (04) 939 3050 or email: finance.manager@ rongotai.school.nz. Application is by CV to the Finance and Administration Manager, PO Box 14-063, Wellington. Applications close 12 August 2016. Ph: 022-120-7684 Deliverers Required in and confidential For private meetings 10am - 8pm. Chef Hannah Thornton has Adam Levy used local, Returning Officer A solid seasonal produce Real Estate provided by Worser Bay School children, friends and family to put together a tasty array of treats that will be on sale at the school fair on Sunday, November 8. Applications are available at our recruitment Mehlhopt office or at thePhone security Lana gate based in the Ngauranga George in Wellington. 383 7008 | 027 28 33 904 Licensed Under REAA 2008 Contact Barry 472 7987 or 021 276 6654.
kia mahi hei kairahi i te Reoand itā mātou was professional, friendly, completed whanau kei te kura o Newtown. Mē mohio the job to a high standard. The work was Trades andi teServices te tangata kit e korero Reo Māori me also done at a competitive price and we ōna tikanga. Ka taea e te tangata tem ahi would again.mā ” tahi menot ngāhesitate tamariki,toe use rimathem kit e tekau toru ō rātou tau. Ka timata tēnei In Conjunction with tunga NZMP āwe te timatanga off o te 2016.warranty. Tono mai tou er tau a 5 year tātai pumanawa mua i tefor 20conditions. o WhiringaSee iwebsite a-Rangi, 2015. Children from Worser Bay School have school’s own pizza ovens, Thai ﬁshcakes 32.Lyric Lyricpoem(3) poem(3) 49.Man’s Man’stall tallsilk silkhat(9) hat(9) ACROSS 32. 49. ACROSS delved into their backyards 1. to make this and many other food stalls will be keep33. Swamp(3) 51. Nimble(5) 1.Verbatim(4,3,4) Verbatim(4,3,4) 33. Swamp(3) Nimble(5) (abbr) (3) 51. Angry (5) ACROSS (abbr) (3) 51.day. Angry (5) ACROSS year’s school fair something7. special - and ing everyone fed on52. the 38. Diplomatic etiquette(8) 52. Most vulgar(7) Mourns (7)(5-6) 38. Diplomatic Most vulgar(7) (7) 33. Sphere (3)(3)etiquette(8) Solidify by by cooling (7)(7) 1.7.Mourns Result (5-6) 33. Sphere 52. Solidify cooling 1. Result very local. The theme for this year’s fair is “Our 40. Up to this place, point time (8) 53. Sheltered corners(5) 11. Declare invalid (5) 40. Up to this place, orortime (8) Sheltered corners(5) 11. invalid (5) 38. U.S. horse race; ... Derby (8)(8) 53. Anaesthetic (5) 7. Declare Scoundrel (7) 38. U.S. horse race;point ... Derby 53. Anaesthetic (5) 7. Scoundrel (7) Using produce the children have scav42. Foretell(7) 54. OfHumbleness theside(7) side(7)(7)(7) 12.11. Quibble (3-4)Secret Garden”. 54. 42. Foretell(7) Of the 12. Quibble 40. Restrained (8)(8) Humbleness 11. Pulls (5)(3-4) 40. Restrained 54. Pulls (5) enged from their backyards 13. and with a little Worser principal Jude(11) Pente44. Lacking integrity(7) 55. Doggedly(11) 13.12. Majestic (5) (7) 44. Lacking integrity(7) Doggedly(11) Majestic (5) 42. (7) 55. Friendship 12. Deviousness For allCasual your residential electrical needs, 42. Casual (7) 55. Friendship (11) Deviousness (7) Bay School help from local suppliers, chef and school(5) (5) cost says this ties in well with the learning 46. Celestial body(6) 14.13. Lie(9) 46. Celestial body(6) 14. Lie(9) 44. Annual (7)(7) 13. Excellent from repairs tocalendar design to installation. 44. Annual calendar Excellent 47. Lyrical(6) DOWN 15.14. Reduce inlevel level 46. Scoffs (6)(6) DOWN 14. Alert (9) in 47. Lyrical(6) DOWN Reduce mum Hannah Thornton has15. put together an theofof children have been doing this year. client revisions: 46. Scoffs DOWN Alert (9) Free47. quotes, no job (6) too Manservant 1.1.1.Sound (5)(5) 48. Affray(5) 15. 15. So (9) Harbour platform(5) importance (9)“Relationships are 48. Affray(5) Harbour platform(5) importance 47. Manservant (6)big or small. 1. Sound So (9) (9) amazing array of goodies to stock the popuat the heart of1 our 2 3 4 5 $0illegal $0 $25 $50 $75 48. Form of expression (5)(5) Sent (11) 16. Directs (6) 49. Gloss(5) Instigators 16. Scarcity(6) 49. Gloss(5) Instigators ofofillegal 16. Scarcity(6) 48. Form of expression 2. Sent (11) 16. Directs lar deli at the fair on Sunday, November 8. (6)school and strongly2.2.2. reﬂ ected in our curContact the team at 49. Water vapour (5)(5) 3. Shy (8)(8)'What 18. Skull (7) 50. Attempt(5) activities (11) and 18. Gun(7) 50. Attempt(5) activities (11) 18. Gun(7) 49. Water vapour 3. Shy 18. Skull (7) riculum. This year's “We really wanted to use as much local inquiry, Stewart and Rogers on REMINDER: Please check URL, email address and closing date 50.50. Gambol (5)(5) 4.3.3.Of public revenue (6)(6) 21. Disorder (4) (4) Artifically high voice(8) 21.into James Dean starred in Our Backyard' Gambol 4. Of public revenue Artifically high voice(8) 21. James Dean starred 21. Disorder produce as we could as it came season. Who isinin has been of PLEASE NOTE: thatfull we have prepared 5. Turn outwards (5) 23. 23. Racket (3) 5. Turn outwards (5) Racket (3) 4. Large sum of money; ‘East of …(4) 4. Large sum of money; ‘East of …(4) SOLUTION SOLUTION 0800 800week, 949 21 July this advertisement proof based onaour “The children and their parents have rich learning experiences and provides Solution last SOLUTION SOLUTION job: WN23893 size: 10 x 3col format: mono 6.understanding Constrict (7)(6) 25. Take by by sipssips (3) (3) 6. Constrict (7) 25. Take ‘king’s (6) 23. Dolt(3) ‘king’s …’ 23. Dolt(3) For April 6,2005 2005 For April 6, of…’ the instructions received. or book a job online at Solution last week, 11 November brought in lots, as have friends and family great link to the fair.” For For July April 28, 9, 2003 2004 For For July April 28, 9, 2003 2004 7. Has high 27. Stake (4) 7. Has morals(8) Stake (4))(3) Series ofmorals eight(5) 25.27. Son of( Scot )(3) 5. Series ofadvertisement, eight(5) 25. Son of( Scot In5. approving thehigh it is (8) the and Kim [Chin] from Miramar Fruit Supply Money raised from the fair will go towards www.stewartrogers.co.nz 8. (6)(6)to check the accuracy 8. Reduce 28. Artlessness (7)... Artlessness (7) 6.Reduce Decline(7) 27.28. ‘Roots’ author; ...Haley(4) Haley(4) 6. Decline(7) ‘Roots’ author; client’s responsibility publication run date position27. supplied the rest.” various Call us now! 9. Sanction Low chair; Chaise ... (6) projects. 9. Sanction (7)(7) and the media and 30. Low chair; Chaise ...school (6) of7. both the advertisement Tepid(8) 28.30. Circular building(7) 7. Tepid(8) 28. Circular building(7) see cost estimate Hannah has assorted a tasty range inIn(3) the(3)past these have included help position nominated. 10. Audacity (5) with Expert; ... hand 10. Audacity (5) 32. Expert; ... hand 8. Illusion(6) 30.32. Steers(6) 8. Illusion(6) 30. Steers(6) 16. Arrange in steps Strange cluding preserves, chutneys, mustards, additional 16. Arrange in staffing, steps (7)(7) 33. Strange (3) (3)digital technology, 9. Stingy person(7) 32.33. Lyric poem(3) 9. Stingy person(7) 32. Lyric poem(3) Cancellation of adverts booked 17. ‘Old Blue Eyes’ Frank ...(7) Zealous 17. ‘Old Blue Eyes’ Frank ...(7) 34. Zealous (6) (6)teacher professional cordials, kimchi (a Korean pickle), relishes development and the 10. Healing ointment(5) 33.34. Charge(3) 10. Healing ointment(5) 33. Charge(3) with media will incur (5) a media Island Bay Plumbing 19. Competitor In brisk time(music) 19. Competitor (5) 35. In brisk time(music) (7) (7)of a writing 16. Plan(7) and even a pizza sauce. 34.35. Dwell(6) engagement specialist. 16. Plan(7) 34. Dwell(6) cancellation fee of $50. 20. N.Z. Prime Minister 36. U.S. state (4) 20. N.Z. Prime Minister 36. U.S. state (4) 17.Most Most- difficult(7) difficult(7) 35. themiddle middle 17. InInthere the For those wanting an early35. start are of(7) of(7) Worser Fair 168 1975-84 Sir Robert Biblical vessel (3) Bay School SirSeatoun Robert ... ... (7)(7) 37. Biblical vessel (3) 19.1975-84 Accustom(to hardship)(5) 36.37. Stimulus(4) 19. Accustom(to 36. Stimulus(4) also Christmas cakes and mince meat for Heights Rd, Sunday, November 8,hardship)(5) from 22. Boils (7) 39. Curve (3) your contact: 22. Boils (7) 39. Curve (3) Vanita 20.Deep Deepred redcolour(7) colour(7) 37.Telepathic Telepathicpower( power(abbr abbr)(3) )(3) 20. 37. Christmas pies. 11am to 2pm, rain24. or24. shine. Some Eftpos Catch (3)nose(7) Cupid (3) 41. Cupid (4) (4) 22.Catch Part the nose(7) 39.41. Compass heading(abbr abbr)(3) )(3) 22. Part ofof the 39. Compass Burgers, dumplings, pizzas from thetoheading( available. 26. Group of whales 43. Exposed to air (7) 26. Group of whales (3)(3) 43. Exposed air (7) 24.Enemy(3) Enemy(3) 41.Be Begloomy(4) gloomy(4) 24. 41.
elln ess Advice from... Adelaide Trading Co. We like good quality food: simple, clean, straightforward. We make our own, as much as we can. You can get ATCo jams, marmalades, pickled vegetables, spiced red cabbage, tomato relish, house-smoked fish, ricotta and more. We simply wish to provide good food, great drinks, to look after you, your kids, and the planet at the same time. We want a simple life, spending time with our families, and making enough to keep the wolf from the door. We’ve been around the industry for a while. We’ve seen quite a few changes, lots of trends, and heaps of ‘new’ foods. And we’ve learnt a few things along the way. So we’d love to see you at Adelaide Trading Co sometime soon. Who knows? You may like what we do. You may meet new people. Make new friends. Isn’t that what it’s all about? Don’t let the flu get you! Flu is a viral infection which cannot be treated by antibiotics; once you have caught flu you have to let the illness run its course and for people with a fragile state of health this is risky and a number of people die from the illness every year. Flu vaccinations are free for people over 65 and for most of those with a ongoing health conditions. Newtown Medical Centre warmly welcomes enrolled, new and casual patients and is committed to providing excellent health care to our community. We are a part of the Newtown community and understand that because our community comes from many different places and different cultures, it is essential to offer a level of medical care specially suited to each patient. Unichem Cuba Mall and Courtenay Place Colds and flu are often confused for one another, especially when it comes to treatment. A cold is a mild viral infection of the nose, throat, sinuses and upper airways. The flu is an acute viral infection of the respiratory tract. The flu is a serious illness that can affect even the fittest, healthiest people. With so many painkillers, nasal sprays, cough syrups, throat lozenges, multi-action tablets and decongestants available, it can be confusing to know what to chose. At Unichem Cuba Mall or Courtenay Place, we take you through some of the most common cold symptoms and what kind of treatments work best. Commonsense Organics Commonsense Organics, Rongotai Road, Kilbirnie has everything you need to keep you and your family well this winter. We have qualified naturopaths in store every day who understand the effects these colder months can have on your health. Whether it’s recommending a naturally fortifying tea, a balm to ease aches and pains or a herbal supplement to boost your immunity – we’re sure to have just the thing to suit your specific needs and have you ready to embrace the springtime! Who Am I and What Can I do For You? I am a Remedial Massage Practitioner who is passionate about massage as an effective and natural healing modality. I bring 10 years of experience to my new practice in the vibrant and creative Newtown.Grounded in Anatomical and Remedial training, I also add energetic and bio-energetic resonance techniques to produce results of an exceptionally effective and lasting nature. I work with you to address concerns or to simply promote deep relaxation, thereby boosting the immune system and promoting natural de-ticking. Whether addressing chronic conditions or maintaining a strong state of health or repairing muscular dysfunction, I highly recommend adding remedial massage to your ongoing health plan. Wishing you Health and Happiness. Sianna@ Sublime Massage. Aches and pains? Need remedial care? Or simply need to lift your spirits? 172 Riddiford Street, Newtown Hours are from 9.00am to 4.30pm, Monday to Friday. • About 1 per cent of• Verrucae the population •• Orthotic Services • Orthotic Services Skin and Nail problem Dr. •Tim Halpine (or 42,000 patients) are treated with Skin and Nail • for Orthotic Caring your feetServices Dr. Tim Halpine blood or blood products each year. Dr. Tim Halpine problems Caring for your feet Caring for jets your feet That’s equivalent to 110 jumbo Dr. Tim Halpine • Orthotic Services Harbour City Tower, 29 Brandon Street Caring forCentre your feet Wellington & the Ngaio capacity Medical full of people or nearly Ph: 04 473 Phone: 869604 473 8696 • Harbour City Tower, 29 Brandon St Email: Tim.Halpine@xtra.co.nz ofLevel Eden 2, Park. 85 The Terrace, Wellington Wellington & Ngaio Medical Cen Dr. Tim Halpine (opposite Solnet House and Aurora Terrace). We have a special in treating Ph:interest 04 473 8696children Phone: 04 473 8696 • - We have a special interest inpTerrace, treating children Email: Tim.Halpine@xtra.co.nz • People who inWellington acciCaring feet Level The w w w .2, a c 85 t i vfor ehave f e e tyour obeen d iatry .c om www.activefeetpodiatry.com dents and ered massive (opposite House and Aurora Terrace).childre We havesuff aSolnet special interest in blood treating loss may need multiple transfusions Ph: 04 473 8696 - We have a special interest in treating children www.activefeetpodiatry.com ofLevel red blood cells and other blood 2, 85 The Terrace www.activefeetpodiatry.com components. www.activefeetpodiatry.com being surgery at 19 per cent. Due to the exceptional business growth this Jim's Mowing business the operator finds he needs to downsize his business giving you this Golden opportunity. This new business comes with a stable base of 60 clients and a cut value of around $2,200. These clients are primarily centred in the Northland/ Kelburn area, and have the potential to grow beyond the $100k turnover of the existing business. When you call 0800454654 for more information Quote 8DDA as our reference. SHOULDN’T YOU HAVE YOUR SAY?